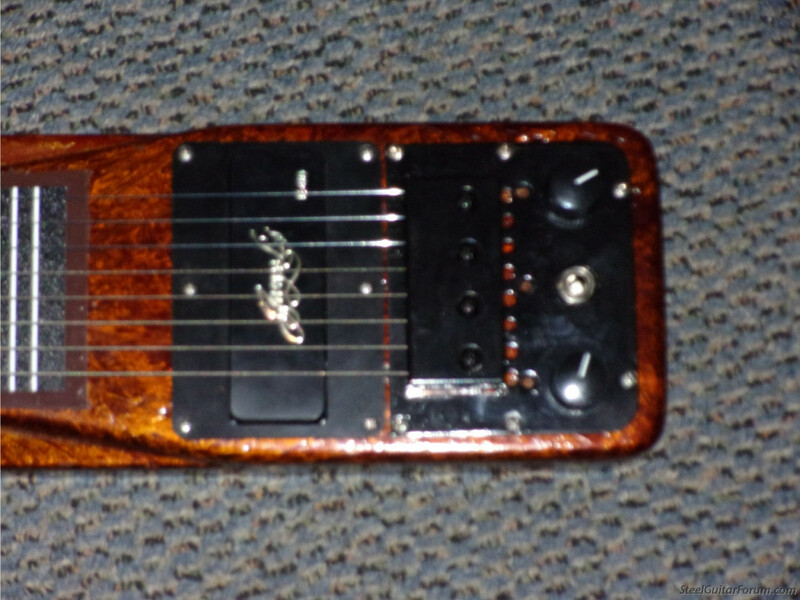 This Emmons lap steel came into the shop for repair. It had already been modified and the customer wanted a George L's pickup put in so there wasn't any way it was going to end up looking original. When it arrived the fretboard was bent and peeling, the plate that anchored the strings at the bridge end was bent. To bring this instrument back to life, the existing plate was machined out to make a place for a new Melbert bridge and the plate was shortened to make room for the new pickup. A cavity was routed out for the new pickup with an added custom vinyl pickup ring from Pickguardian. The new scale length ended up at 23.5". A local machinist engraved a new fretboard to match the scale. Another lap steel saved from the grave yard and nothing parted out. Great work as always Bob. Hope all is good in Tennessee. Loving my lap steel. Nice job saving that steel!